We’ve been running stories gleaned from our oral history archives for several years. However we should have been more clear about what Oral History is and what it is not. Oral history is about persevering the memories of our community elders – as they remember them. Good oral history reflects the language and “way things were” in the words of the person being recorded. Oral history is NOT meant to be documented history. Any two people may remember the same incident very differently. Examples: the story of the Ethyl Dow plant being fired on from a U-Boat during WWII. Also the tales of the Fort Fisher Hermit – some think he was a hero and others think he was a bum? Who’s right? How do we prove it? That said, last month’s interview with Jimmy Davis stated; “The only thing that was on that side of Dow Road, was the old Dow Plant. 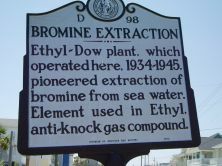 It was down toward Kure Beach almost where that bad curve is they made poison gas during the war.” For the record they did not EVER make poison gas at the Dow Plant. There is a nice article on the plant and its history at the following web site: http://www.ncmarkers.com. Or, go to Google, type in “North Carolina historic highway markers.” At the state site search “Dow” under New Hanover County. There is a much longer essay about the Dow Plant and its fascinating history. I will try from now on to insert within brackets corrections to patently false statements. Please, if I miss something and there is a statement that is historically inaccurate please let me know by phone or e-mail and I’ll run a notice in the next newsletter. But remember; at least a few people must have truly believed that “poison gas” was being made during that long ago war, and that’s worth documenting also.